Aiming at representing and reasoning about multidisciplinary design knowledge explicitly and exchanging it in different design environments, this paper proposes an ontology-based collaborative reasoning strategy for multidisciplinary design in the Semantic Grid. An ontology-based modeling framework is used as the basis, which adopts Web Ontology Language (OWL) to build a domain-specific multidisciplinary design repository, and allows the design agents to visit ontology repository effectively through ontology-based services. On the top of modeling framework we propose a multi-agent collaborative reasoning environment, which utilizes OWL as the content language of FIPA ACL, and supports the ontology-based collaborative reasoning for multidisciplinary design between multiple design agents. 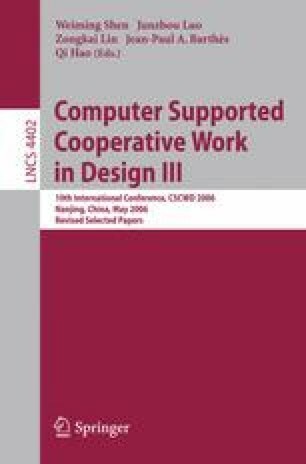 This important enhancement facilitates the implementation of Computer Supported Cooperative Work (CSCW) in multidisciplinary design for Semantic Grid applications.